Understanding the line between Sadness and Depression. Did you know, Senior citizens experience ‘the blues’ in greater measure than younger folks? Healthcare professionals should be able to distinguish between sadness (“the blues”) and depression and we have put together this important information for their benefit. Is it “The Blues” or Clinical Depression? and alone. However, normally these feelings pass and we find the strength to go on with our lives. Clinical depression is different. Although it may feel similar to “the blues,” depression is a sense of sadness or hopelessness that just won’t go away and, in many cases, seriously interferes with day- to-day living. Contrary to what some people may think, depression is not a character flaw or a sign of weakness. It is a medical condition that can affect anyone. In fact, today more than 19 million Americans suffer from depression. The good news is that depression is highly treatable. Eighty to ninety percent of people with depression will respond well to treatment. The bad news is that many people suffering from depression – as many as 66 percent – do not seek help and consequently do not receive the care they need. No one knows for sure why some people cross the line from simply feeling “blue” to becoming depressed. Some of the most common causes may be a genetic predisposition, physical changes like menopause, a catastrophic life event, a severe illness, or even an adverse drug reaction. Depression may also result from too much stress – pressures from family responsibilities, financial problems, or separation from a loved one. Finally, depression may be the result of a chemical imbalance in the brain that may be treatable with medication. Because they are often faced with severe changes and adjustments in their lives, seniors are one of the highest risk groups for depression. Sixty-five percent of older adults suffer from some form of the condition. Disability, death of friends and relatives, loneliness, loss of independence, or the sense that life is drawing to a close, may leave even the strongest senior feeling depressed and even suicidal. In addition to the normal process of aging, conditions like Parkinson’s disease, stroke, Alzheimer’s disease and thyroid dysfunction can hamper neurological function and result in depression. Certain medications that are prescribed more frequently to elderly patients may also have an adverse effect. Chronic illness is another frequent cause of depression in seniors. Although it is normal to be upset when diagnosed with a serious or progressive illness, it should not become an obsession that interferes with the quality of a person’s life. If left untreated, depression can actually exacerbate a chronic condition in several ways. It can weaken the immune system, intensify the perception of pain and other symptoms, and increase the likelihood of improper management of the illness. In extreme cases, it may even cause premature death. 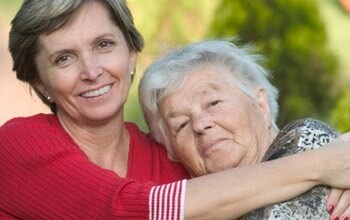 When the debilitating physical or mental effects of aging or illness make it necessary for a parent or older relative to be cared for by a family member or friend, the ensuing stress can result in depression affecting all parties. For the senior, depression usually stems from the loss of independence and the shame of needing to be “cared for” like a child. For the caregiver, it may result from a combination of family friction, the burden of providing round-the-clock attention, and even longstanding disagreements. For both, guilt, a loss of privacy, and a sense of the over-all unfairness of the situation, all tend to feed depression. These feelings are normal, understandable, and even predictable. In a stressful situation, the most important thing one can do is to acknowledge that there is a problem. Recognize that circumstances are difficult for everyone involved – the older relative, the caregiver, and all the other family members living at home. Accept the fact that everyone has had to make adjustments to accommodate what may feel like an “unnatural” situation. Counseling and other treatments may be necessary in order to open lines of communication, air feelings, and arrive at workable solutions. Fortunately, there are a growing number of community-based programs available that can help seniors get the care and socialization they need during a portion of each day. These programs also provide the at-home caregivers with some needed time for themselves. For the older adult who is relatively mobile and not mentally impaired, senior centers offer the opportunity for social interaction and participation in stimulating recreational activities. Many communities even provide door-to-door transportation for seniors to and from these facilities. For seniors who are physically or cognitively disabled, there are also specialized adult day health care programs designed to take care of both their health management and social needs. If you or someone you love experiences symptoms of depression for more than a week or two, it is important to seek help immediately. See your family doctor who can refer you to a professional counselor or specialist in order to get to the root of the problem. If the depression appears to stem from unresolved family or personal issues, your doctor may recommend psychiatric or crisis intervention counseling. If the cause is neurological, a variety of advanced medications are available that can be effective in relieving the symptoms of depression. Recent research has also shown that one of the most beneficial treatments for depression may be as simple as a program of regular exercise. What are Some Warning Signs of Clinical Depression? Remember that depression is highly treatable. If you think you may be suffering from depression, the most important step to take is to see your physician. This entry was posted in HealthCare News, Long Term Nursing and tagged depression, preventing depression, sadness, senior blues, senior depression, treating depression. Bookmark the permalink.